I originally wrote this post in February of 2011. But I feel like reposting it today. Making good choices when I’m angry involves a recurring surrender for me. I didn’t grow up in an environment where anger was filtered through loving conversations and safe expressions of emotion. The kids we meet in youth ministry may have the same type of environment and we probably don’t talk enough about mental health in youth ministry. I want to offer a few ways to be able to cope. If you’re angry, please try this. If they’re angry, please help them try this. It’s an easy way to gain control and find comfort in moments that are difficult. Our church has a counseling center and the space has been recently expanded. I feel like this addition to our environment is over the top blessing for us as we lead and serve teenagers. The coolest part about having licensed counseling professionals in the building is that our teams have an easy referral. I can always tell a student who needs extra care and support that they have resource right here in our church to help them. The unexpected side effect to the center’s existence are the openings on “the couch” where I find myself from time to time. I always walk out of the room having gained wisdom on how to counsel and respond in different situations. Not to mention the parenting/ personal counsel I get just because Rowena loves people and she can’t help but help us. She’s one of the best counselors I know. We were discussing a particular situation involving one of our students and one of our counselors clients (with permission) and she gave me some advice to practically walk students through their anger. I struggle with anger sometimes. If you’re being honest, you realize that we all do. 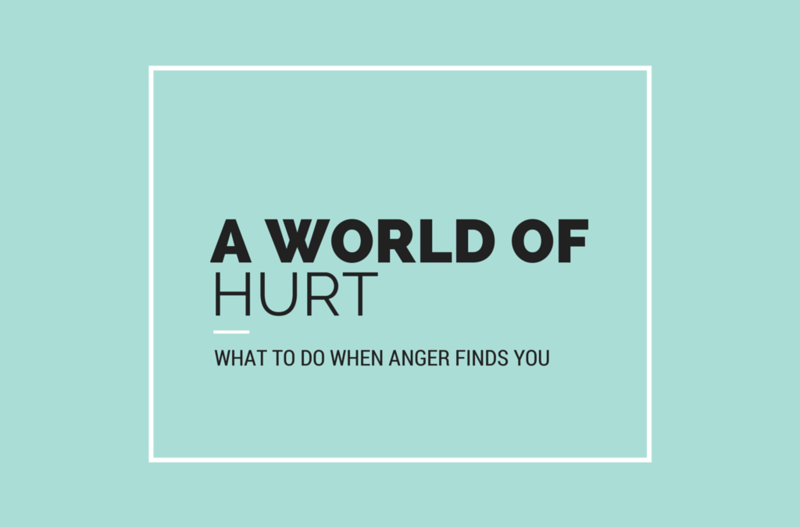 What Rowena helped me to think about was that there is what she calls a “world of hurt” under the anger we see in our students (or ourselves) and it’s important to begin to understand that world if we are to work on it. Anger leads to bitterness and resentment. It causes us to say and do things that we wouldn’t want to say and do. It often leaves us feeling guilty and ashamed but we don’t feel like there’s a lot we can do to control it. There are students in our ministries who really struggle with anger…anger concomitant with adolescent development can be the perfect storm for disaster. There was a student who had expressed anger toward me on Wednesday nights. I did my best not to provoke it but I usually find a way to do just that–when I try to encourage him in the right direction or get him to stop a disruptive or disrespectful behavior. Rowena gave me some things to remember and to pass on. -In everyone’s anger there is a world of hurt. -Beneath that hurt there was probably an expectation that wasn’t met–whether it was a fair expectation or not–the hurt or feeling offended comes from this disappointment. -And under expectations not being met is a core need. Most of the time this need is a need for love, acceptance, belonging, feelings of safety and security. Helping our students look back to where their anger started is helpful to me. Asking the teenager what’s really going on when they puff up and lash out during youth group could give us a clue. How to deal with anger or help someone else deal with theirs. I yelled at my daughter one night when she had an accident while trying to get to the potty. I was exhausted. The panic of my 3 year old woke up our 1 year old. I was hoping to have a few minutes of quiet before bed but instead I would have to clean up the floor, get new pjs, put the baby to bed (again). And I yelled at her. It wasn’t her fault. She hadn’t been feeling well. She didn’t sleep much the night before. She was on medication for her ear ache. There was a lot going on. I would love to become more aware of the triggers that set me off so that I can calm down and make decisions better, that I could stop myself from yelling before I’m in the situation and have another action in mind. Isn’t it all too easy to spout off in a text message, fire off a loaded comment or blog, or vent to someone else when we are angry? But it often leads to more pain and more anger. Maybe a few simple steps are what you or your students need. If you need someone to help deal you deal an with anger-related situation or need tips on how to regain control. Talk to someone. If you’re in Lakeland, Rowena’s information is listed here.